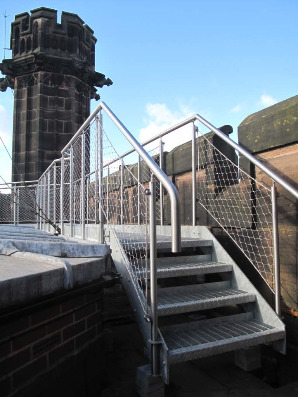 Working with Calibre Metalwork, Stockport, Bollin Rigging installed specialist "Webnet" infill to Tower, Bell Chamber and Walkways throughout the Cathedral allowing tours of the upper areas to be used in safety by the public. 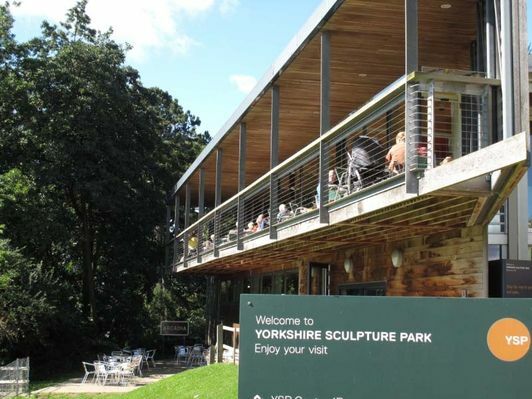 Bollin Rigging supply and maintain balustrade and rigging wires at this prestigious site. For this project we were tasked with manufacturing 6mm diameter infill wires to match existing assemblies. We were able to supply and install a large number of wires to an extension of the original development on time and within budget. 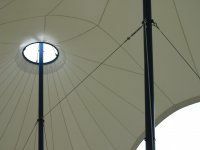 Bollin Rigging installed the 5mm diameter tension wires to this extensive project in Warrington. 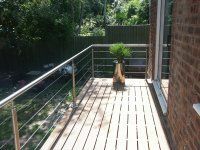 A small job, but we manufactured and fitted this balustrade to the client's deck within 7 days of their order. We can turn jobs around in a short period should this be required. 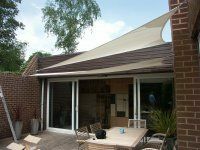 Our client wanted a "nautical" feel to his deck and we designed, supplied, and fitted these sails to imitate the look of a yacht's mainsail and jib. Working from a cherry picker, we installed these 18mm diameter galvanized wires and turnbuckles to provide further tensioning and security to the tensile fabric canopy covering the entrance. 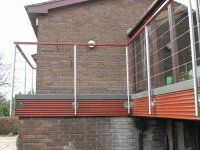 Bollin Rigging installed this side mounted balcony balustrade to avoid damaging the waterproof deck. 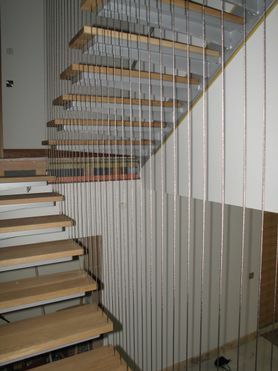 Using special brackets and a timber handrail along with our trademark wire infill, we produced a safe and good-looking solution to match our client's requirements. Installed as part of a modernising garden makeover, we fitted the owner's steps with handrails to provide safety with a highly contemporary look. 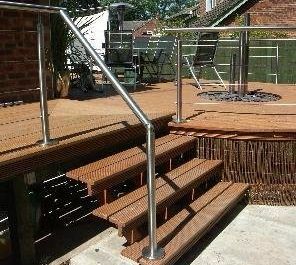 The second phase of our client's garden makeover: We supplied and fitted stainless steel handrails to existing timber posts and fitted decking wires between the posts to provide a highly attractive feature to the garden. 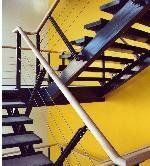 Starting as a kit of machined parts pre-built in our workshops and supplied for the client to install, this balustrade was completed by the owner of the house, who was a competent DIY enthusiast. London Pleasure Gardens - Part of the London Olympic site. Bollin Rigging supplied and installed over 3000 linear met of 5mm infill wire and fittings to the newly installed balustrade on this prestigious site at very short notice. 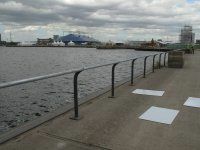 Working closely with the company who supplied and installed the baluster posts and handrail, Bollin Rigging found solutions to enable the project to be a complete success. 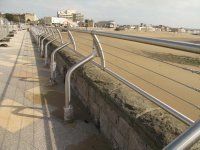 Bollin Rigging supplied a specially designed 6mm-wire and tensioner system to new stainless steel seafront hand railing. 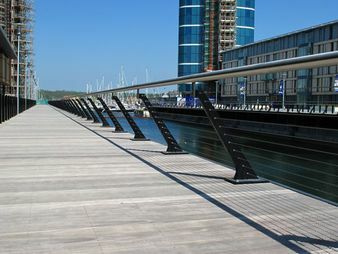 A three-wire system was supplied to over 600m of balustrade. Designed by the architect, we implemented this project designing both the system and also the roof and floor steels to attach the wires top and bottom. 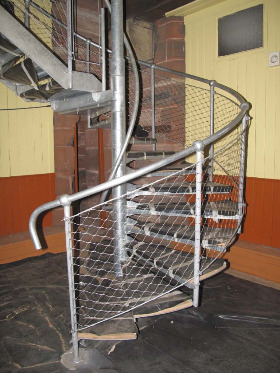 This balustrade was supplied as a kit of machined parts and featured a curved top rail to one section. It was installed by the house owner who was competent at DIY.